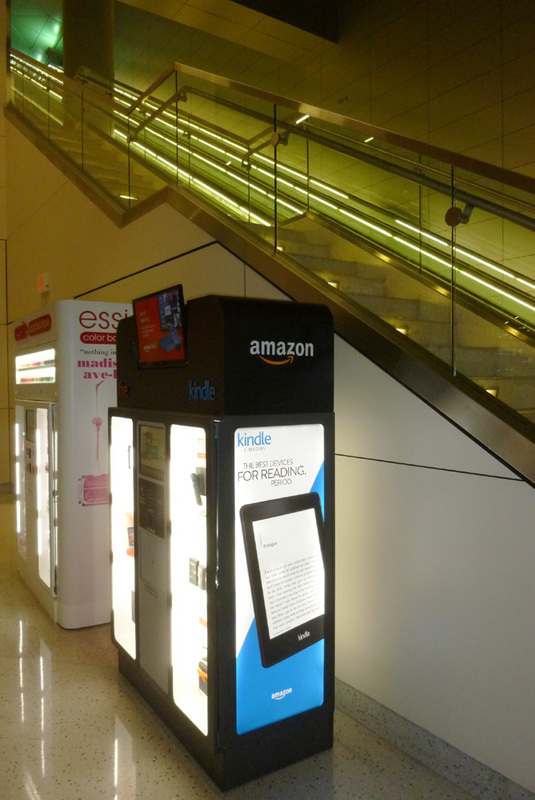 Few small presses can afford to ignore Kindle’s huge chunk of the market. (Even large presses struggle to do so.) If we want our poetry books to be bought, sold, and read electronically, we have to get them into a format that Amazon likes, and that means the proprietary formats of KF8 and/or mobi7. Fortunately, a KF8 is mostly an EPUB with a little Amazon-specific coding on it; we don’t need to redo much of our work with the EPUB. Amazon has also provided us with free tools to make the conversion smooth. Okay, here’s how to covert your EPUB file to a KF8/mobi7 file. You ready? Drag your EPUB file into Amazon’s Kindle Previewer application. Okay, that’s not quite it. There are a few other things you need to do, and most of them are minor workarounds. Once I expand the window, I see that the only “warning” is that I didn’t specify a cover (I’ll have a separate post about covers and E-books). The file, sitting on my computer, is 80KB. 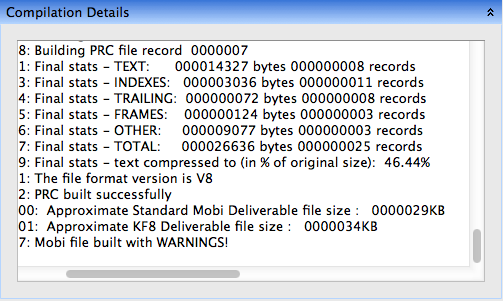 Yet Amazon Kindle Previewer is showing the Mobi is ~29KB, while the KF8 is ~34KB. Huh? 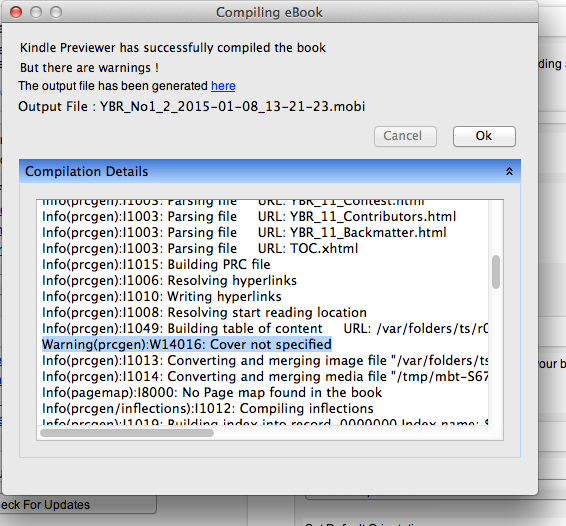 The mobi file created by Kindle Previewer is a bundled package (or even a package of .pkg files). The 80KB file on my desktop holds both a KF8 (for newer Kindles, including all color models) and a mobi7 file (for older Kindles with physical keyboards). When we do this process with a “real” poetry E-book that has a few color photographs, such as Carrie Rudzinski’s A History of Silence, we get a Mobi file of 1419KB and a KF8 of 1402KB. Where the 17KB go is anyone’s guess. This moves us back to where we started at top of this article: face to face with the Amazon way of business. See, the assumption Amazon makes, and it’s not a bad one, is that publishers will upload their finished files to Amazon.com so customers can buy the Kindle version. Amazon’s servers know which model(s) of Kindle a customer owns, so they’ll send out the correct version via WhisperSync when the customer makes a purchase. The vast majority of Kindle transactions take place over Amazon.com’s servers; many customers don’t even realize there is another way. That other way is, broadly, sideloading. All Kindle devices, and most phones and tablets that can run the Kindle App, can be connected via USB to their owner’s computer. From there, owners can drag and drop the .mobi file from their computers onto their Kindles. This is how Bicycle Comics sells its Kindle books. The only downside is that we sell the “fat” version, which contains both MOBI and KF8 formats. Otherwise, customers would have to write us about upgrades when they changed Kindles, and that would be a big hassle. Say what you will about Amazon, they’ve made the Kindle Store fall-down easy for readers. Sideloading is somewhat more commonplace in the EPUB side of E-readers, because many Android/ Kobo/ Sony owners are accustomed to getting their E-books from a variety of sources. You might even come to see the extra hoop of Kindle Previewer as a small price to pay for the convenience of the Kindle system. After all, beyond the Amazon, it’s a jungle out there. I’ll post .mobi files and updates to .html with my next technical post.